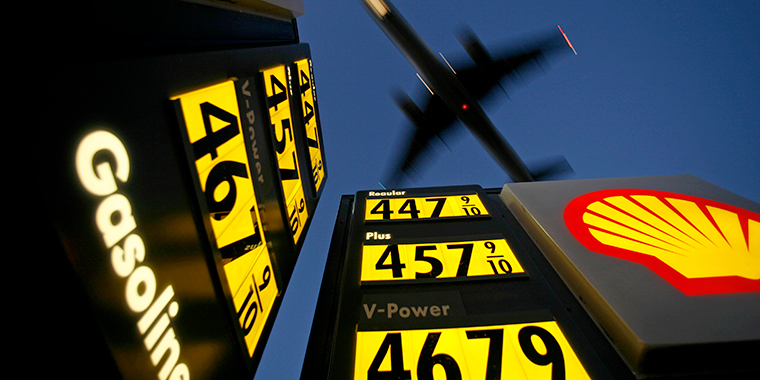 Gasoline prices are advertised at a gas station near Lindbergh Field as a plane approaches to land in San Diego, California, on June 1, 2008. In 2016, more than 85 percent of the world’s primary energy consumption came from three major fossil fuels (coal, natural gas, and oil), the extraction and use of which releases greenhouse gases into the atmosphere. Hydroelectric power and renewable energy resources (10 percent) and nuclear energy (more than 4 percent) accounted for the remainder. Not all countries consume the same amount of energy. For example, China, European Union countries, and the United States combined were responsible for slightly more than half of the world’s total coal, natural gas, and oil consumption. Nor do all countries use the same precise mix of fuels. In Norway, primary energy consumption is dominated by hydroelectric power, but in Saudi Arabia, oil is the major fuel. The map below shows the amount of primary energy that select countries consumed in 2016 and breaks down each country’s consumption by type of fuel.